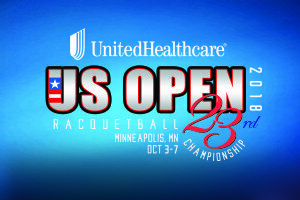 USA Racquetball‘s US Open, currently the UnitedHealthcare US Open, has been held once a year for the last 23 years. Originally held in Memphis, Tennessee, it has been held in Minneapolis, Minnesota since 2010. During 14 of those tournaments, Austin area racquetball player Kane Waselenchuk has won the International Racquetball Tour‘s Pro Division. During the 2017-2018 season, Kane was sidelined by injury for a number of tournaments taking him from his usual top ranking to the third ranked player for the seeding of this event. Embedded below, you can follow his matches from the 2018 tournament, including a few post match interviews that were broadcast live on Facebook. During the same tournament, he also played pro doubles with Ben Croft, and they made the finals. Post match with @kingkanerb after his 14th US OPEN Championship. The G.O.A.T. Come chat with Kane after his 14th US OPEN.